When I first started getting into fashion (read: broke out of my 7th-grade-t-shirt-jeans-and-slip-ons rut), I over-accessorized just a little. Okay, a lot. I’m still an accessory fiend, especially when it comes to jewelry. I’m an addict. But as my style has evolved, I haven’t found it necessary to wear a bracelet, ring, earrings, and a necklace with every look. Now I usually wear two or three of those things at a time. That said, all those years of breaking Coco Chanel’s “take one thing off before you leave the house” rule with reckless abandon made me pretty good at mixing and matching accessories. So below, I’ve chosen five occasions and a bracelet, ring, necklace, and earrings combo for each. Wear all four together like the not-always-wrong high school me would have, or pick a subset. 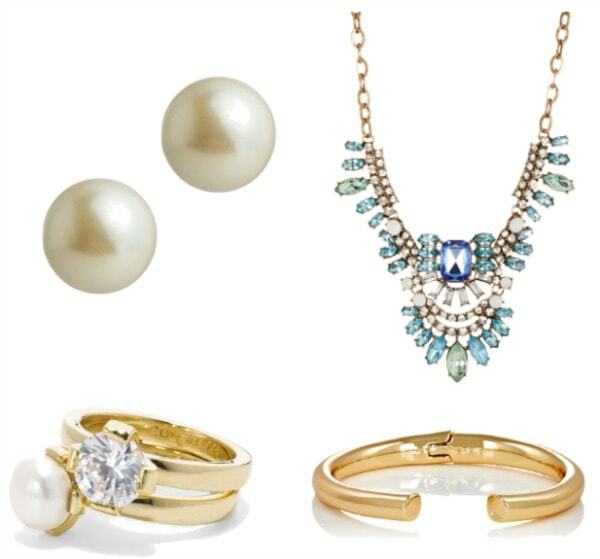 Either way, treat yourself to some guilt-free bling: all of these pieces are under $50. A simple, comfy t-shirt and jeans outfit is the perfect opportunity to rock some bright jewelry. Stacked bracelets and/or rings are casual but provide a trendy touch, and a delicate necklace and playful earrings add interest without stealing the show from the arm party. On warmer days, this combo would also be awesome with a maxi dress. Finish your internship ensembles — sheath dresses, a blouse and A-line skirt, a tee, blazer, and cropped pants — with one major statement piece and some dainty, personal extras. These layered strands are all you need to make an outfit, and are high-fashion but also professional. I love personal touches like this initial ring, and the bracelet and earrings add a fun-but-appropriate hint of sparkle. This combo has to be my favorite, since I’m a sucker for pearls, colorful rhinestones, and shiny yellow gold. I can’t help it–I love all that glitters! When going on a date, you have two options for crafting a great outfit: you can rock a statement article of clothing like a jumpsuit, embellished jacket, or printed pants, or you can make a simpler piece, like a solid fit-and-flare dress, more special with killer accessories. The combo above, like the one for work, centers on the fab necklace but also adds hints of sparkle in other places. I like combining pearls with any other jewelry that has white in it, for a classic-meets-modern feel. And this cuff is so chic and minimal, if you buy it you should basically never take it off (also, I might steal it from you). 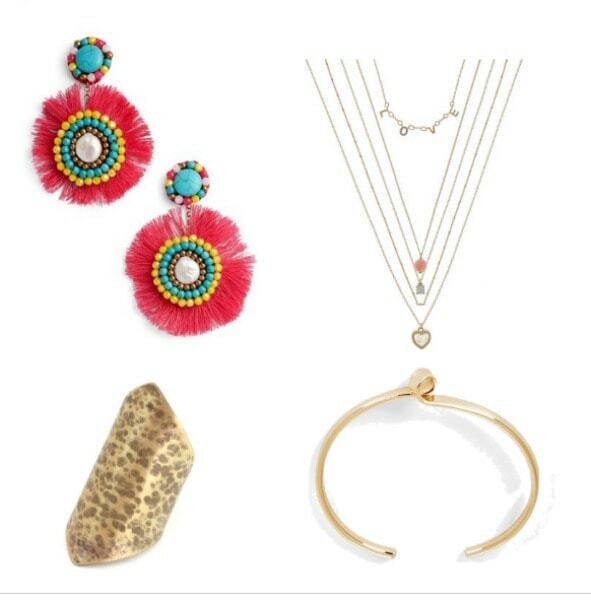 A casual party or group hang is a great time to have a little extra fun with accessories. Choose a pair of statement earrings that lean more towards the wild and trendy side then the classic (side note: these babies would also be fantastic with a bathing suit over spring break). Then, feel free to toss on some other jewels that seem simple but are also great conversation starters, like a boho ring, a twisty cuff, or some layered, personal necklaces. Products: Earrings – Last Call, Ring – Bling Jewelry, Bracelet – Belk, Necklace – Torrid. When you have an opportunity to get really glammed up, go for it! Your best LBD, poofiest party dress, or even that brightly-hued gown you have left over from Junior prom gets an upgrade with some bold bling. 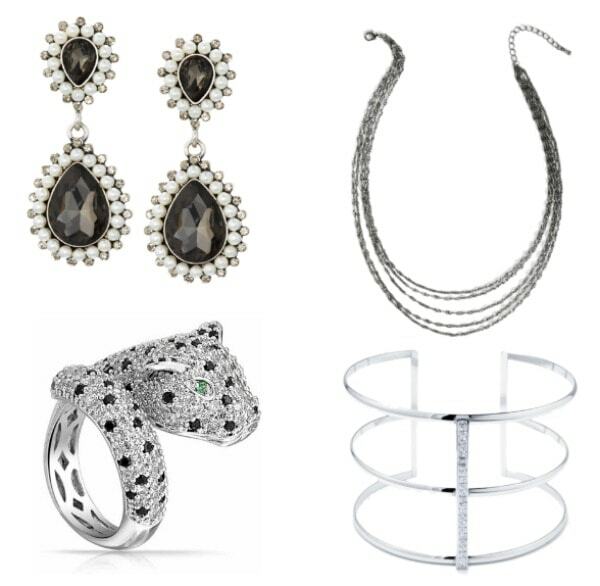 I love the chic, slightly quirky feel of this leopard ring, and these earrings are a big statement but also so polished. A sculptural cuff or some layered chains are sleek touches, too. Do you wear a lot of jewelry? How much do you usually wear at a time? What is your favorite jewelry combo, and what sort of outfits do you pair it with? Let me know in the comments! Next Ask CF: What Should I Wear for My Video Interview?